In the absence of the expansive unanswered interview that should have graced these pages, my heart is too heavy to reconstruct thoughts and reflections now many moons old. Such a shame as the Blizaro story has never really been told and this happens to be their most cohesive material as a band. Dark, heavy, brooding and eccentric like Gallo himself, horror freaks will approve. The creepy, almost luminous, visuals fitting too. Yes, it genuinely seemed that the creative juices were flowing and he confided that there should be a second Blizaro album released on Razorback in 2016. As the months passed with neither reply nor said CD surfacing my hopes gradually faded. 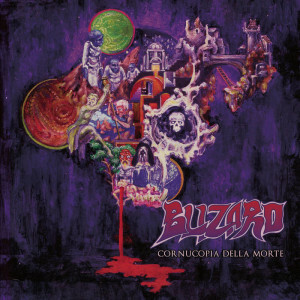 The last murmurings back in February of this year were that Blizaro was on an indefinite hiatus and he would be focusing on Orodruin instead. Sadly, I’ve heard that before. The “In Doom” 10″ EP remains unreleased from the previous decade in spite of the best efforts of Miskatonic Foundation and Pariah Child. Goodness knows if “Doomsday” has or will ever make it to the studio. But don’t hold your breath. Both bands could have been and should be so much more than they are if only they were a little less dysfunctional.